With her smart phone in one hand and a leash for her guide dog in the other, Portland State University student Katie Durden tested the latest in indoor navigation to explore the PSU library this week. “Main Elevator. Six Yards,” said a female voice from her phone. Portland State University student Katie Durden tested a wayfinding app to navigate the university library with her guide dog Betsy (not pictured). The first two floors of the library were digitally mapped as part of the Mobility Matters conference this week. Durden was one of about 200 people who attended PSU’s Mobility Matters 2019 conference to learn about emerging technology and design to help everyone access safe and reliable transportation. Disability specialists, urban planners, engineers, transportation professionals, students and community members converged to share ideas. “Today is the day to share your challenges and your frustrations and help each other be more creative in how you approach designing and planning for transportation,” said Jennifer Dill, professor and director of PSU’s Transportation Research and Education Center (TREC), which coordinated the event with the College of Education and support from Digital City Testbed Center. Speakers from PSU and around the country shared technologies including interactive 3D printed tactile maps, applying smart paint to sidewalks and streets that signal smart canes for blind and visually impaired pedestrians and apps that do everything from alert traffic signals to a pedestrian’s unique mobility needs to providing verbal indoor maps. One app, pathVu, measures the accessibility of sidewalks including the slope, roughness and distance to the curb. The app maps the results for users and city officials to help prioritize improvements. Durden came specifically to try the indoor Nearby Explorer Online, an app that offers verbal wayfinding complete with points of interest and a compass. American Printing House for the Blind, the app’s developer, was on campus for the conference and even digitally mapped the first two floors of the PSU library using open source material and small beacons to transmit data. The company has a popular app for sidewalk navigation, but the PSU library is now one of about 60 indoor spaces that APH has mapped so far. The verdict? It was tough to figure out how to position the phone to trigger consistent directions, said Durden, who is blind, but it’s definitely better than not having directions at all. Nearly 200 people attended Mobility Matters at Portland State University this week to learn about emerging technology and design to help everyone access safe and reliable transportation. Marsha Cutting, chair of Kitsap County Accessible Communities Advisory Committee, was eager to learn about accessible technology to bring back to Washington. She has a few ideas that she plans to pitch to her community. “This is an amazing conference,” she said. smart paint: Ohio State University partnered with industry, government and education experts to develop a paint that can trigger sensors. When a cane equipped with these sensors detects smart paint, it vibrates. If you outline the crosswalk in smart paint, for example, the feedback can help guide people with vision impairment safely across the street and beyond. pathVu: The app measures the accessibility of sidewalks including the slope, roughness and distance to the curb. The app maps the results for users and city officials to help prioritize improvements. PedPal: Accessible Transportation Technologies Research Initiative is developing an app that will allow pedestrians to interact directly with the intersection and actively influence traffic signals based on their unique mobility needs. Interactive 3D printed tactile maps: Portland State University and Cornell Tech collaborated to test interactive, 3D-printed tactile maps on campus with visually impaired users. Testers gained relevant information about key buildings on campus and several of the testers reported that the system would be an effective way to pre-plan for travel to a specific destination. Nearby Explorer Online (indoors): American Printing House for the Blind takes its app Nearby Explorer, a city sidewalk navigation tool, and moves it indoors. The app uses open source material and small beacons to transmit data to smart phones for verbal navigation cues. The first two floors of the PSU library are now among 60 indoor spaces that APH has mapped so far. Mobility Matters has even sparked innovations on campus. Jon Fink, director of PSU’s Digital City Testbed Center, attended last year’s conference and said it inspired his proposal for the research center, which offers campus-based testbeds for new technology. This year Fink shared his vision for the new center and asked developers to consider PSU as a testbed for their technology. The conference also examined the impact that race has on access to safe transportation. Kimberly Kahn, associate professor of social psychology at PSU, shared her research about how race influences the way drivers react to pedestrians. In randomized field experiments, researchers found that black pedestrians in crosswalks were passed by twice as many cars and waited 32 percent longer than white pedestrians. The study also found that drivers stopped closer to black pedestrians than they did to white pedestrians. This could have significant impacts on pedestrians of color who are also blind or in a wheelchair. “We haven’t paid enough attention to the ways in which race intersects with ability to shape the experiences of persons of color who may have fundamental challenges in other areas,” said Marvin Lynn, dean of the university’s college of Education, who spoke at the conference. Portland State University students Katie Durden, left, and Lillian Goodman use an indoor wayfinding app to navigate the university library with their guide dogs Betsy and Spinoza (not pictured). The students attended the Mobility Matters conference this week to learn more about technology that improves access to safe transportation for all. A panel of experts with lived experiences shared their challenges and successes. 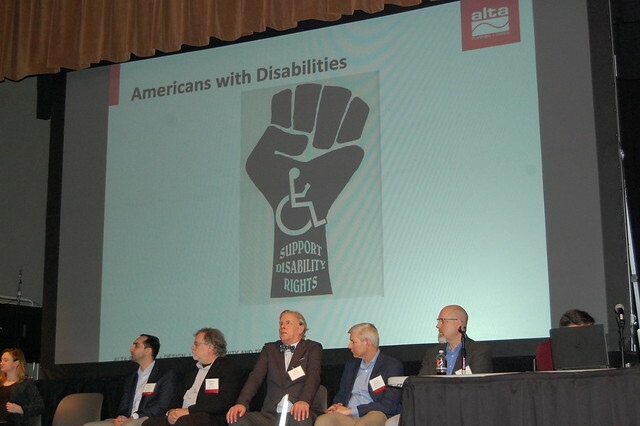 The panel included Jan Campbell, with Multnomah County’s Aging and Disability Resource Connection; George Stern with DeafBlind Citizens in Action and Chris Pangilinan, public transportation policy manager at Uber, a disability rights advocate and a PSU graduate. Pangilinan stressed the importance of building alliances and showing how these issues impact many, not just those with disabilities. He helped bring attention to chronic elevator outages in New York subways by teaming up with parents who use strollers, people with temporary injuries and others who were also impacted. “It’s not just a persons with disabilities issue,” he said about safe access to transportation. Michael Cantino with Portland Community College shared information about interactive 3D-printed tactile maps at Mobility Matters. The conference drew nearly 200 people to Portland State University this week to learn more about technology that improves access to safe transportation for all. This event was hosted in partnership with the College of Education and the Transportation Research and Education Center (TREC) at Portland State University. COE is the largest and most comprehensive school of education in Oregon, offering more than 50 programs in education and counseling. The hybrid online Orientation and Mobility program is the regional program for the Pacific and Northwest Consortium for Vision Education, comprised of six states: Oregon, Washington, Hawaii, Idaho, Alaska and Montana. The O&M program is closely affiliated with the College's nationally accredited Visually Impaired Learner (VIL) program. TREC is home to the National Institute for Transportation and Communities (NITC), the Initiative for Bicycle and Pedestrian Innovation (IBPI), and other transportation programs. TREC produces research and tools for transportation decision makers, develops K-12 curriculum to expand the diversity and capacity of the workforce, and engages students and young professionals through education.